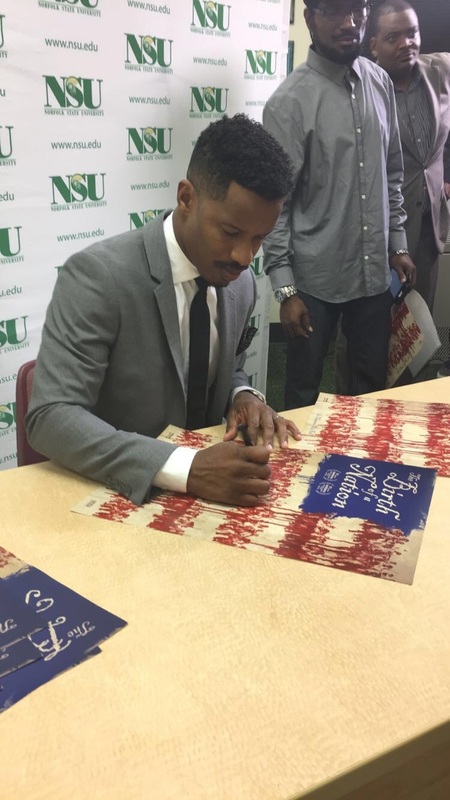 Actor, director, producer and writer Nate Parker is finally stamping his mark in the film-making industry. Parker has already made his mark in the acting world by appearing in amazing films such as “The Great Debaters” and starring in “Beyond the Lights.” Now, with the upcoming movie release of “The Birth of a Nation,” people are able to see his directing, producing and writing skills on the big screen. On Sept. 27, Parker gave Norfolk State University the privilege of hearing him speak at the Little Theater in Brown Hall. The film is based on the Slave Rebellion of 1831 led by Nat Turner. In addition to Parker being born and raised right in the Hampton Roads area, the Rebellion took place on this very land. Parker found it especially important to bring this event back to his home both for himself and the film. While at the event, students and the general public were able to hear about his experiences while creating this film and why it is so important. Later that evening, Parker rented out three theaters, which turned into four due to the theaters reaching capacity. Over 70 students from both Norfolk State and Hampton University were able to watch the film. The movie is truly amazing and shows the talent Nate Parker possesses. More than anything, this film shows Parker’s bravery. He has already received negative backlash from some movie critics. Parker did not hold back while creating this film and he should be commended for telling this story. Although the reviews will be mixed and the criticism will be harsh, the story of Nat Turner will have been told. Tags: advanced showing, Birth of a Nation, civil rights, civil war, film, lecture, movie, Nat Turner, Nate Parker, premiere, preview, rebellion, slave, slavery. Bookmark the permalink.